Summary: Based on the true crime and novel by Mara Leveritt, Devil’s Knot explores the murder and trial of three boys that went missing in Memphis in 1993. The crime brings three teenagers to trial and despite pleading innocent and the mounting forensic evidence to support their innocence, the teenagers are persecuted without question and left at the mercy of lawyer Ron Lax who continues to probe deeper into the case and the prejudices that exist within the court of law. The film explores the lives of deeply misunderstood outsiders, their families and communities, and their darkest fantasies. The conviction of the West Memphis Three – Damien Echols, Jesse Misskelley, Jr., and Jason Baldwin – riled the American justice system, shocked a tightly knit religious town and outraged the nation. The story of The West Memphis Three has been itching to be turned into a feature film for a great deal many years now. Countless documentaries have been made around the case over the years, and so powerful is the story of injustice that it has been impossible for anyone to sit through them without some kind of anger building up inside them. To be brutally honest the whole story (or should that be saga) is really a screenwriter and director’s dream. 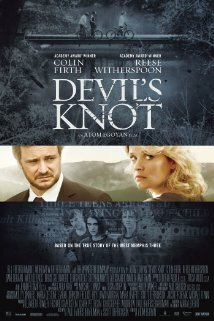 Devil’s Knot looks at the case of The West Memphis Three told through the eyes of a private investigator, Ron Lax (Colin Firth) and one of the grieving mothers, Pam Hobbs (Reese Witherspoon). As Hobbs desperately tries to work out what happened in her son’s murder Lax concentrates on the theory that the three accused, Damien Echols (James Hamrick), Jason Baldwin (Seth Meriwether) and Jessie Misskelley (Kristopher Higgins) are innocent. Oscar nominated director Atom Egoyan decides to tackle the case head-on in his latest film Devil’s Knot. Now a rookie filmmaker may have simply decided that this film should be told through the eyes of one of the accused but Egoyan is smarter than that and instead digs up the story of one of the case’s lesser known players, the private investigator hired by the three accused’s legal team to try and clear their clients name. So not to make the film too one sided Egoyan also tells part of the story through the eyes of Pam Hobbs, a grieving mother who seems more open to the fact that injustice is being done than anyone else involved in the case. Early on Devil’s Knot is a promising film. It digs up certain parts of the case that are naturally overlooked in most explorations into the case including the mysterious ‘muddied and bloodied black man’ who was spotted in a fast food diner on the night of the murders. But it’s not long after that revolution that Egoyan seems to let Devil’s Knot dangerously let itself down. Just as Lax beguns to uncover series leads that suggest a Police cover-up and Police corruption the film pulls back from how hard-hitting it should have been and instead becomes a court room drama in the vein of a television show like Law & Order. The second half of Devil’s Knot shows why a director of the class of David Fincher needs to get hold of this story and do something with it. The links of the boys to the occult and Satanic rituals could have taken the film into some dark places while the whole Police corruption element and them deciding to investigate Ron Lax needed to have a lot more suspense put into it then what it shown here. For Devil’s Knot to work there needed to be less of Lax sitting around in an office and talking to the lawyers and more of him actually out on the street doing the leg work – after all he had to be getting these leads from somewhere, right? Perhaps the most ironic thing about how much the screenplay lets down the film is that it comes from the same pen as Deliver Us From Evil, Scott Derrickson. As a result Egoyan really under uses his two leads. Colin Firth seems like an actor champing at the bit for a dramatic scene right throughout Devil’s Knot while Reese Witherspoon plumps up and heads into the similar character territory she explored in Mud but again she is let down. Instead of allowing her character to deliver some powerful scenes when she starts suspecting her own husband, Terry Hobbs (Alessandro Nivola), as being involved in their son’s murder. It’s a sad point to make but the screenplay here really does let down both Firth and Witherspoon. Devil’s Knot could easily have been one of the best films of the year, but sadly it is let down by a director and screenwriter who seem reluctant to tap into the suspense that is handed to them on a plate. Instead the second half of the film becomes a slow court room drama that never really lives up to its potential. Colin Firth and Reese Witherspoon try in vain to deliver something but even they are let down dangerously by a script that needed to be much better. Other Subculture Entertainment Reviews of ‘Devi’s Knot′: For our full Devil’s Knot review please check The Good The Bad The Ugly Film Show Ep #89. You can also read Dave’s review on The Book The Film The T-Shirt.